As I was planning a garden-to-table menu for the Winter Solstice I knew that I wanted to use roasted eggplant from the freezer, but I couldn’t find a recipe that I felt worked well with the rest of the menu. So many eggplant recipes involve tomato sauce, and they just didn’t go with the scallops and kale or the potatoes and leek in cream that I was also preparing. I preserve my garden eggplant by peeling, slicing and roasting it in the oven until just barely browned and tender. It is roasted plain, without oil. 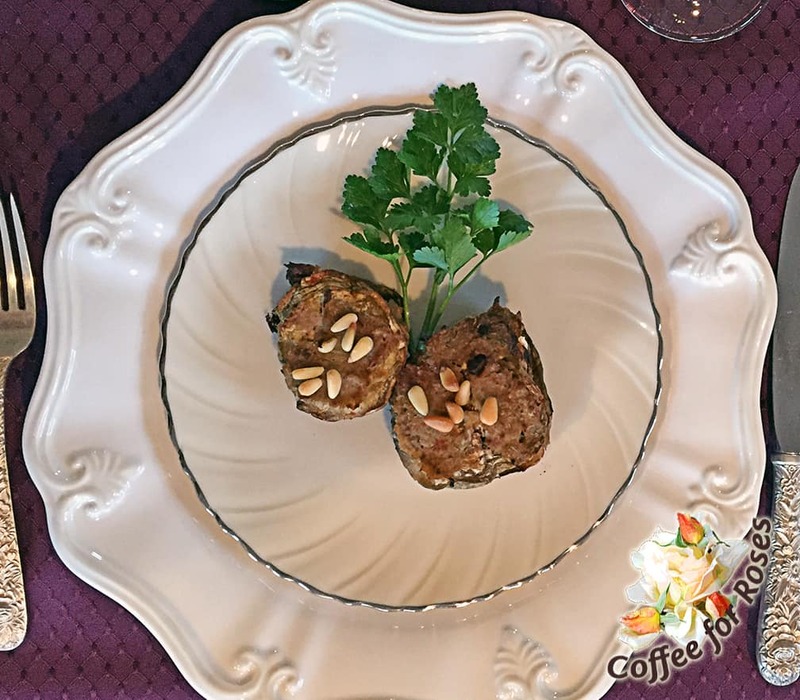 I decided that it would be good to use feta cheese and chopped figs with these eggplant rounds, but it still needed something moist to hold it all together. “What about fennel puree?” my husband asked. Brilliant! This dish was wonderful – unusual, delicious and rich without being heavy. It could also be made without the cheese if you or your guests are vegan. This can be served as a side dish or first course. Roasted slices of 2 eggplants – frozen or freshly made. Slightly thaw and separate the eggplant slices if they were frozen. Pair the slices up with similar sizes. In between each slice put some of the crumbled feta and a few pieces of chopped figs. Spread about two teaspoons of the fennel puree on the top slice and place it over the other ingredients. After all the pairs of eggplant slices are filled, spread a thin layer of the fennel puree on top of each. Dust with smoked paprika and sprinkle with a few pine nuts. Bake in a 350 degree oven for about twenty to twenty-five minutes. 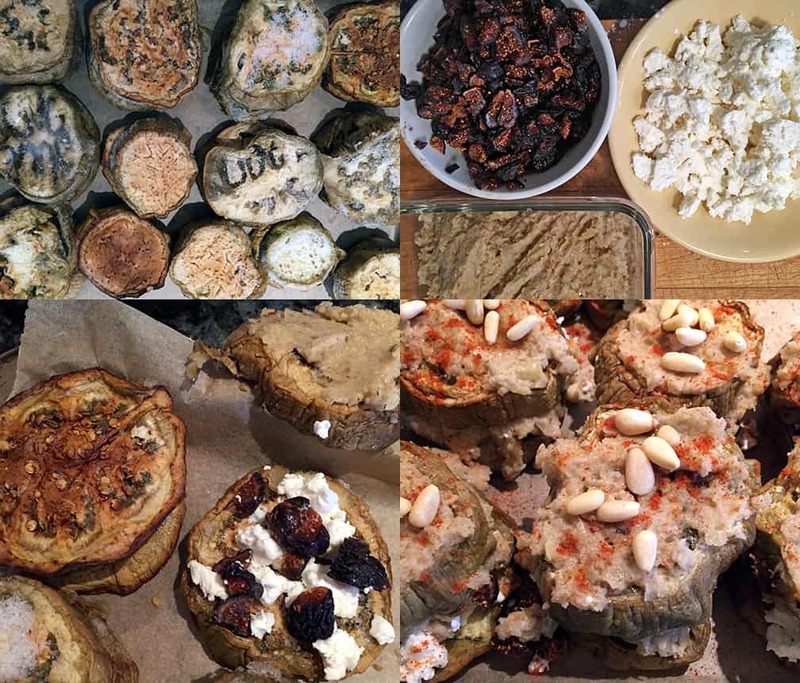 Clockwise from top left: rounds of semi-frozen roasted eggplant; pre-chop the figs, crumble the feta and make the fennel puree…you can do this while roasting the eggplant or letting frozen eggplant thaw; pairs with the cheese and fig on one side and the underside of the top spread with puree; top each stack with some more puree, paprika and pine nuts. This could be served as a course in itself, or as a side dish with other veggies, meat or fish.